Australia is being mealy mouthed about protectionism. Treasurer Joe Hockey blocked the A$3.4 billion ($3.1 billion) takeover of agricultural trader GrainCorp by U.S. rival ADM on Nov. 29, on the grounds that Australia’s grain market is only just getting used to competition, five years after the national wheat monopoly was disbanded. For Australia’s foreign investment prospects, the decision itself is less bad than the ambiguity over why it was made. The reason for blocking ADM’s bid seems to rest on the idea that a foreign bully is worse than a local one. After all, there’s little evidence that the combination would affect competition. Australia’s competition watchdog, which monitors the wheat industry, has already said it found no sign that the market would be concentrated – only that a big position in grain handling would pass from one company to another, which happens to be foreign. Hockey’s logic isn’t totally bankrupt. As well as having most of its stakeholders outside of Australia, ADM would also have paid a hard-to-justify takeover premium. The A$70 million of synergies it predicted at the time of its offer in May, taxed and capitalized, might be worth around A$500 million, compared to the near-A$800 million difference between its bid and where the shares fell to on Nov. 29. That might incentivize it to shut down capacity, as Australia’s farmers fear. The alternative, though, may be worse. Australia’s highly indebted agricultural sector could use capital, and ADM has plenty – its $2.3 billion of cash and short-term investments at the end of September was ten times GrainCorp’s. While Australia’s harvests are pretty dependable relative to other growers, it has been losing market share to aggressive Eastern European rivals, forcing it to seek ways to forge new relationships with buyers in Asia. Investors can live with nationalism. Previous blocks on bids for the Australian Stock Exchange and Woodside Petroleum did little to dim Australia’s appeal to foreign investors. But fickleness is more troublesome. When his Liberal Party won the election earlier this year, Prime Minister Tony Abbott promised Australia was “open for business” – and this latest decision goes against that grain. GrainCorp Chairman Don Taylor arrives to the company's Annual General Meeting in central Sydney December 20, 2012. Australia’s treasurer Joe Hockey rejected a takeover of grain trader GrainCorp by its larger U.S. rival ADM on Nov. 29, on the grounds that it was “contrary to the national interest”. The deal was valued at A$3.4 billion ($3.1 billion). Shares in GrainCorp fell to A$8.75 on Nov. 29, having traded around the A$12.20 offer price for most of the time since the latest offer was announced on May 1. 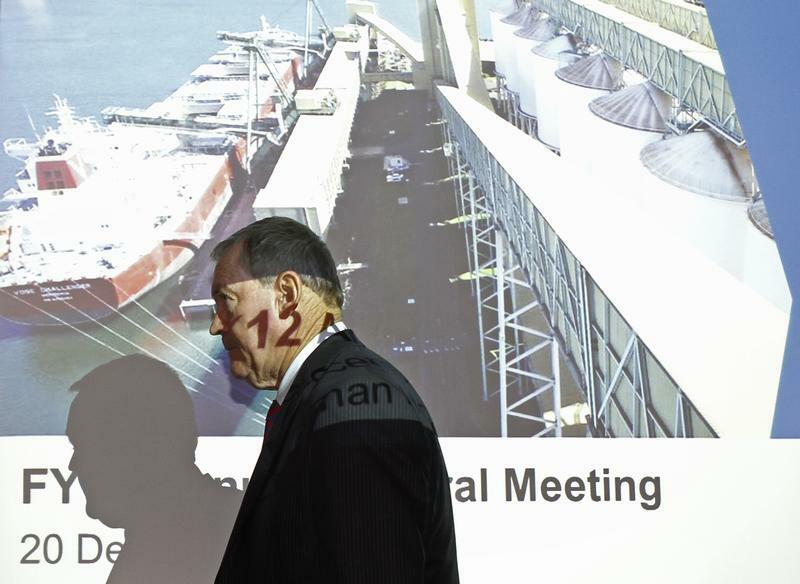 ADM, which already owns 20 percent of GrainCorp, said it was “disappointed”. Hockey argued Australia’s wheat industry had not yet become a fully competitive market, five years after the national wheat marketing monopoly was disbanded. He added it was not the “right time for a 100 percent foreign acquisition of this key Australian business”. Australia was the world’s third biggest wheat exporting country in the year ending July 2013, according to the U.S. Department of Agriculture. Its national production was valued at A$7 billion for the year ending June 30, according to the Australian Bureau of Statistics. Hockey’s predecessor Wayne Swan blocked a bid by the Singapore Exchange for ASX, which owns the Australian stock exchange, on April 8, 2011, claiming that the combination would be contrary to the country’s hope of building a global financial services centre in Asia.